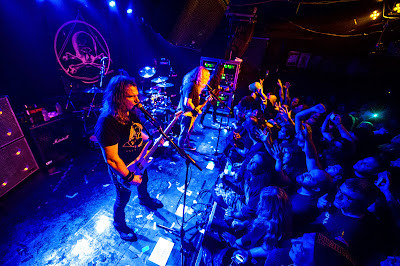 Megadeth played a secret show at the Saint Vitus bar in Brooklyn, New York on December 12 and video from the rare event has surfaced online. The club show landed the day before Megadeth performs at the Revolver Music Awards at the city’s Webster Hall, co-hosted by frontman Dave Mustaine and SiriusXM's Jose Mangin. The group – who recently wrapped up a fall US tour – have a busy schedule this week as they will also perform on NBC-TV’s Late Night With Seth Meyers on Thursday before Mustaine plays a special acoustic concert on Friday at the Hard Rock Café in Boston, MA in support of the charity Music Drives Us. Launched in 2006, the charity supports music education and music therapy programs, and supplies schools in New England with musical instruments, and much more. In their first decade, the organization has donated more than $1 million to help encourage the development and growth of music activities in the region.